Paso’s first distillery, Re:Find, is ramping up production, adding a second still and more spirits, including its first release of limoncello, made from hand-zested Sorrento lemons. 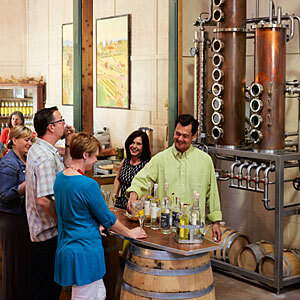 Re:Find operates out of the Villicana Winery, and it cleverly uses the bleed, or juice, created (and typically discarded) during the winemaking process to make an especially good small-batch vodka and gin. You can sample all the spirits free in the distillery’s rustic tasting room, which offers a view of the distilling process in action.